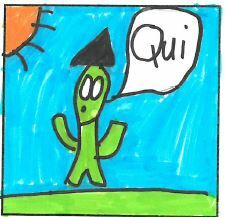 During March, we worked on the second of our 1+2 Language comics – with Whinhill Primary P7, but this time, creating a French language comic. 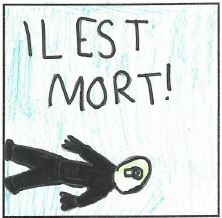 The class decided to create a science fiction mystery comic this time around – and were very clear that it had to feature a massive food fight and a Cat Ninja. Also bananas. Lots of the young people involved were already comic fans – and there was a particular enthusiasm for manga - which came across in some of the comics the pupils created themselves. There was already a real understanding of the visual language of comics, and the ways in which comics can be used to tell stories. As with the Gaelic comic project, speaking French isnt exactly Magic Torch's speciality. In fact, unless you want to know how to ask directions to the beach or tourist information office, we're stuffed....so we were really fortunate to have the assistance of Julia Sanchez Grim in class to help us along with our French phrasing and show us some of the bande dessine (French language comics) that she reads. And a big thank you to Richard Tallaron who translated the class script from English to French. 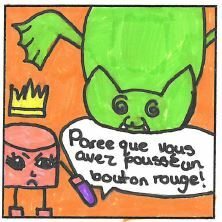 As ever…some wonderful comics created by the pupils…both in English and French.